Acuvue 2 - Exceptional comfort and superior handling. Designed to make wearing contacts easier, these lenses are the most advanced of Johnson & Johnson`s line of lenses. Simply wear them for 1-2 weeks (which means you take the lenses out each night) then throw them away and start on a fresh pair. 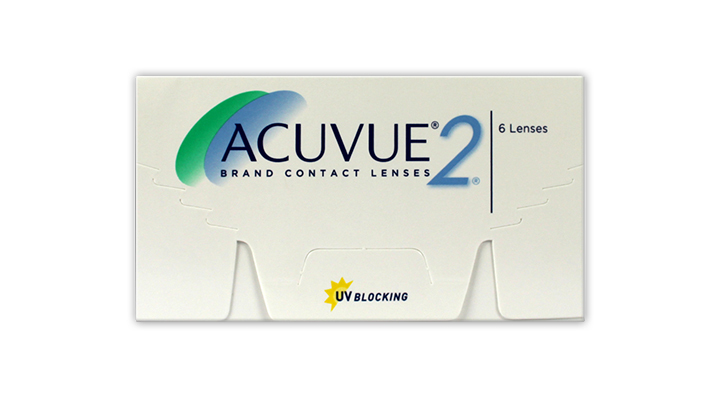 Acuvue 2 lenses have UVA and UVB protection shielding the cornea from potentially harmful UV radiation. In addition there is a Visibility tint and `123` inside out indicator. I used to wear montly disposable lenses but my eyes were get infected too often. After changing to 2 week disposable I no longer get infections. It's very confortable and moist. I recommend it. After trying many different types these are the only ones I will ever use from now on. They do not dry out your eyes and are very comfortable even in dry weather. I've been using contactlenses for over 25 years, Acuvue 2 since they were first introduced to the marked here in Denmark. Every now and then I've tried out other lenses, but I've always returned to Acuvue 2. There are room for improvement but at the moment I haven't found the lenses that over a period of 2 weeks or more are better for me. I do recommend that you always try out new lenses at least for 2 weeks. Using them for nearly 15 years - enough said! As the title says I have been using these lenses for nearly fifteen years, without a single problem or eye infection (touch wood). I have taken part in kick boxing tournaments, played rugby, lacrosse and gone water skiing without ever loosing a lens. Even after extended wear in dry conditions they still feel as comfortable as when I first put them in. I can't recommend them highly enough!